I love these pretty face washers with crocheted trim. They really are pretty, adding a nice touch to the bathroom. And that crocheted trim isn't just pretty, it's practical too. It reinforces the edge of the face washer, making it stronger so it lasts longer before getting tatty and needing to be re-hemmed or put in the cleaning cloth pile. I'm self-taught when it comes to crochet. I like simple patterns and I usually make them up as I go along. Basic crochet is simple; there are books showing the basics, YouTube has hundreds of tutorials showing you how to get started and of course there are websites and blogs in the thousands with simple instructions to get you started. You don't need expensive equipment either. A 4mm crochet hook will cost around $3.50 and will last you forever if you remember to keep it somewhere you can find it. Crochet cotton can be bought on sale. One ball costs around $5, often less at $2 shops and specialist wool shops or online, and you'll get 3 - 4 face washers trimmed from one ball, depending on the pattern you work. The photo is of children's face washers. I've done them for a friend's new baby. They make a lovely gift and when our children were little they'd get a new face washer of their very own in their Christmas stocking each year. I'd buy the face washers on sale through the year and work on them when they were in bed at night. We still have a couple of Barbie washers and Batman and Thomas the Tank Engine washers in the kids' bathroom! Add a cake of lovely soap to a trimmed face washer and you have lovely gift for just a couple of dollars. 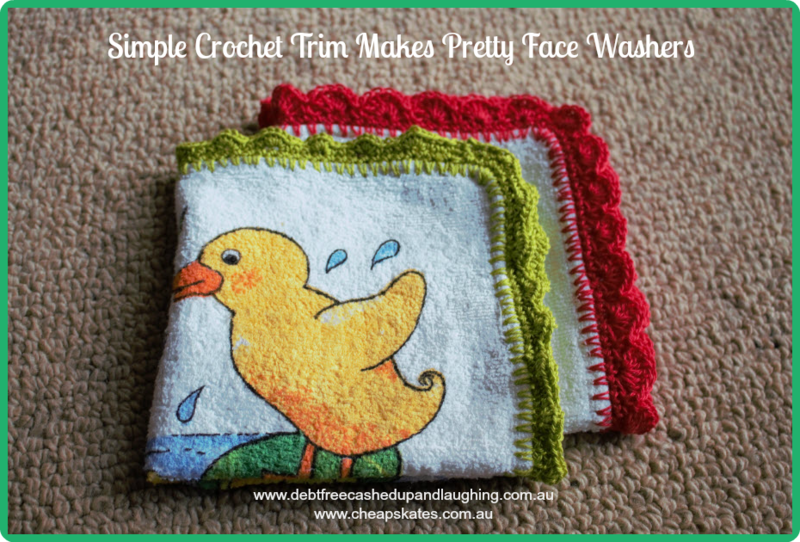 But crochet trim isn't just for face washers. It goes well on hand towels too. And pillowslips look lovely with a crochet trim. Work a trim edge around a square of linen and you have a beautiful doyley. It doesn't take long or cost a lot to add a pretty crochet trim to your household linens. Wow Cath they look pretty cute!